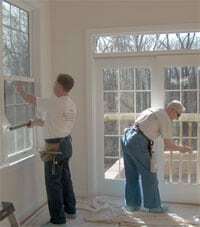 Residential Window Tinting - Montgomery County, PA, Chester County, PA and Lehigh County, PA by All Seasons Glass Tinting. In addition to protecting your family's health, the UV protection offered by residential window tinting films provides protection to materials such as paints and varnishes, plastics, wood, fabrics, and many other materials commonly found in the home which are susceptible to UV damage. All Seasons Glass Tinting installs window tinting films on commercial buildings, residential homes and automobiles. We are proud to use Solar Gard and Panorama window films which are available with a lifetime warranty for residential window tinting customers and we are proud to serve the following areas. Montgomery County, Bucks County, Lehigh County, Delaware County and Chester County's in Pennsylvania. Over time, the sun fades furniture, rugs, hardwood floors and drapes in its path. But professionally installed Window Film blocks out 99% of the damaging ultraviolet rays that ordinary windows allow in. That means that furniture, upholstery, and carpeting will last longer. Window films will reflect the negative solar energy from the hot sun in the summer keeping you cooler and help you retain your positive solar energy in the winter keeping you warmer, which in turn will keep you comfortable all year round. Window films will help reduce annoying glare by filtering the annoying white light within your daylight leaving you a more soothing and elegant natural daylight. Window films come with a durable surface that can be cleaned with most everyday household window cleaners as well.